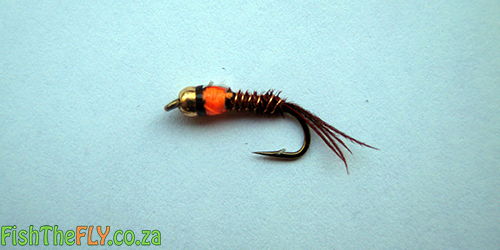 The Orange Hotspot Nymph is one of the most effective nymphs to fish on South African waters. There are very few nymph imitations that can produce the results this fly does. The GRHE and Flashback are great nymphs and are probably the only emergers that can compete with the success the Orange Hotspot can provide the fly fisherman. The fly is known by many other names (Because it is tied in conjunction with other patterns): Hotspot, Hotspot PTN, PTN Hotspot, Hotspot Flashback and so on. There are a few important notes regarding the Orange Hotspot Nymph. The Hotspot should be tie with a bit of flash and a prominent “Hotspot“. This fly can also be tied with heavier materials, such as a tungsten bead, copper wire and lead, and then can be used very effectively as a control fly in the short line or Czech nymphing techniques which are often used for river fish such as Yellowfish. Trout love this fly as well, and many other freshwater fish species can be caught on this fly. At the time of writing this article, Gareth Roocroft of Fish The Fly hooked a +/-10 kilogram Carp on a size 14 PTN Hotspot. Unfortunately the hook pulled as the fish was being landed by fellow Fish The Fly team member Darryn Harvey.